One of the dangerous thing most of the traders often encounter is looking for a breakout with strong momentum and start betting on continuation of the price movement in the direction of breakout without looking into the bigger picture. Flexible to change is one of the biggest skill a trader have to adopt/acquire during the trading career. Often Failure to change lefts deep scar in trading balance sheet. 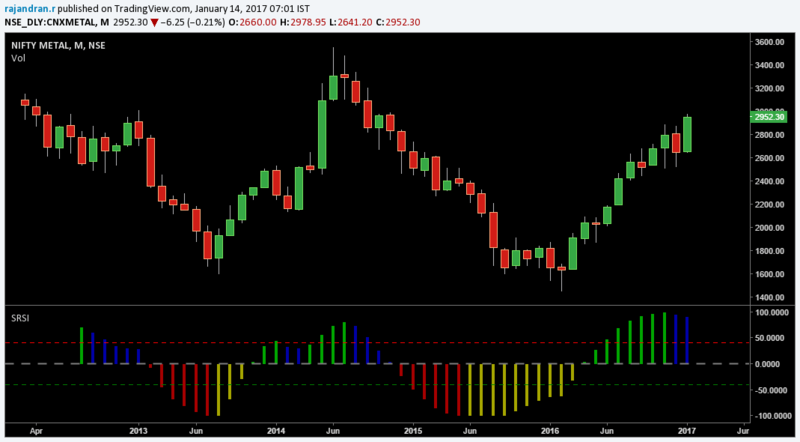 Metal Sector is showing similar breakout patterns if you just look from the short term perspective. Yes there is a clean breakout from the consolidation. But hey, lets look into the bigger picture. The bigger picture talks about how emotional a particular sector/stock is. To track emotions we can use gaps ( Check out last article on Nifty Metal Sector in Emotional Buyers Market ). Monthly Sentiment remains negative despite the sector had registered a fresh 52 week high which is not a healthier sign for a medium term uptrend continuation. In such a scenario if you ask me to think about the odds, I’ll ask you what if 2 gaps out of 10 is going to get faded in NIFTY Metals? That is roughly 667 points correction or a equivalent of 22.5% correction in Nifty Metals. Nifty and Bank Nifty 90 min charts for 11 Jan 2012 Trading Nifty and Bank Nifty is in buy mode on the 90 min charts since 4th jan 2012. currently supports for both nifty and bank nifty comes near to 4746 and 8443 respectively.